For this wedding cake, I used 12" x 3", 8" x 3", and 6" x 3" circular cake molds. I iced them with white butter cream icing. 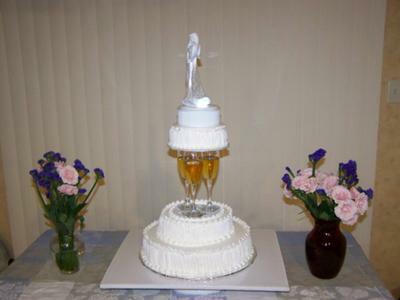 I used plastic dividers to place the champagne flutes, and plastic top cover to placed the revolving lighting base and the nice wedding cake topper. Amazingly, it withstood the movement of the many children jerking the table every now and then looking at the top figurine, I thought it will be knocked over, but it did not. I've been looking around for some pretty glass containers to use to separate my cake layers like that.... mine will be a fall wedding cake. That turned out very PRETTY! WHAT A GREAT JOB! It is a very elegant wedding cake. I like the idea of the champagne flutes. Good job.